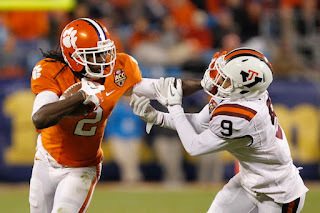 Each week we like to bring you five keys for a Clemson win. Against Virginia Tech, they will need to have 3-4 of these go their way. If not, Tech is capable of leaving town with a W.
Even with Virginia Tech's struggles on defense, they are still talented, especially at the skill positions. They are capable of playing tight man coverage and being very physical, which allows them to control between the hash and sidelines. And they can do this to any team or receiver, including Hopkins and Watkins. But that leaves the middle of the field vulnerable, which Duke picked apart using crossing patterns and motion. Clemson will need to do the same with the tight ends, slot receivers, and backs. I wouldn't be surprised to see either Watkins or Hopkins line up in the slot to take advantage of this area, hoping to find large open pockets and easy first downs. And after a few of those, Clemson can go over the top with deep posts and in routes. Also, the middle will be important in the running game. Virginia Tech has ample speed on defense, which may negate some of the stretch plays and the ability to get to the corner. As such, Clemson will need to find success running between the tackles. Expect to see both Ellington and Watkins attack the middle, trying to get to the second level, similar to what we saw with Watkins against FSU. The Virginia Tech offense is explosive. Last week against Duke they had four scoring plays of greater than 40 yards, and are third in the country in plays of 40 yards or more. Clemson will need to keep Virginia Tech in front of them, forcing them to drive the ball. If Clemson can do this, the Virginia Tech offense will eventually bog down, resulting in either field goal attempts or turnovers. Clemson needed to employ a similar strategy against Georgia Tech, which ultimately worked. By doing this, Clemson stopped multiple possessions: two missed field goals, two failed fourth down conversions, and a turnover. Clemson will need even more success against Virginia Tech as Clemson may not score in the upper 40s against VT like they did GT. Let’s be honest. This is not your typical VT special teams as they don’t block kicks with the frequency they have in the past. But they still have a return game – one that has proven to be significantly better than Clemson’s. In addition to the return game, the VT coverage units are better than Clemson’s. With that said, Clemson is money from the 30 in, which gives them a strong advantage. But Clemson doesn’t need to win special teams to win the game. They just can’t lose special teams. There figures to be a good number of return attempts, especially from kick-offs and Clemson cannot afford to make silly mistakes. Plus, they must tackle well with their coverage units to prevent quick changes in momentum and cheap points. Last, year the Clemson defense looked like a Top 10 unit against Virginia Tech and bottom 10 against everyone else. Clemson’s defensive success can be attributed to Andre Branch. He lived in the backfield, and was able to repeatedly summon the strength to bring down the uber-tall and gifted Logan Thomas. And in the ACC Championship game, his forced fumble on the first play set the tone. For Clemson to slow down this offense, they will need to find a way to create pressure. They will need the ends to get an outside rush, while also keeping contain. And they will need the interior line to get a push, while also being a factor in the run game. If Clemson can manufacture pressure, they will once again have success stifling a potent Virginia Tech offense. On offense, Clemson has proven two things: 1) They will make you pay if you give them good field position & 2) They are capable of going the length of the field on anybody. When Clemson starts a possession on the plus side of the field, they have scored a TD on every possession but one. They immediately place a defense on their heels because they are automatically in scoring position. And you have to cover the entire field, not just the first 10-20 yards. And while Clemson’s offense can overcome poor field position, their defense can’t. At least not consistently. When a defense that struggles giving up points, they can’t afford to give away any cheap ones. If Clemson can just break even in field position, they should be able to win as I trust their offense more than I trust Virginia Tech’s. This will be an emotionally charged game as Clemson and the fan base will be riled up from the pre-game military honors. And Virginia Tech comes in with a bit of momentum and a thirst for revenge. Look for a back and forth first quarter followed by Clemson finding some defensive success in the second, resulting in them taking a two possession lead into the half. The second half will be a draw just before Tech scores a fourth quarter touchdown to make it a one possession game. Similar to BC & GT, Clemson will be in position to tack on a late touchdown. This time they go the route of BC and take the knee, and move to 6-1.